Originally these masks were intended for personal use only, but as more and more friends noticed his mask, they asked Michel to produce some masks for them; after he made four in the first year, word of mouth built him a solid reputation as a quality goalie mask maker. 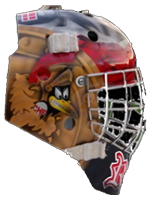 Hand crafted in Canada, goalies across the globe quickly noticed the quality workmanship, and Michel has delivered masks to satisfied customers from France, Italy, Germany, France, Belgium, and the four corners of the UK. These masks are worn by anyone, from professionals to amateur goalies, and because EVERY mask goes through the hands of Michel all his mask confidently carry a life time guarantee. Michel was born in 1959; he started working with moulding at the age of 13 with his father. The elder Doganieri taught him the tricks of the trade, using plaster, modeling clay, silicone, fibreglass, carbon fibre, and Kevlar. With nearly 40 years experience manipulating and shaping these products, he learned the best tricks in the industry to ensure a quality product that is of course safe. Michel actually has a day job, working for Quemont (www.quemont.com), a tire company, where he has been since 1999. Michel actually has a day job, working for Quemont (www.quemont.com), a tire equipement and supply company, where he has been since 1999. He also plays as goaltender since he was 8 giving him the opportunity to test his products and implement the necessary adjustements.